It's with some surprise that we were introduced today to the new HP TouchPad. No, not the one we're currently reviewing. HP is adding another SKU to its roster of WebOS slates, currently numbering one; and they're bringing more than just HSPA+ with the HP TouchPad 4G. Clockspeed has been bumped from 1.2 Ghz to 1.5 Ghz on the updated slate, which could help with the sluggishness some early adopters may have noted. Speed is the only change though, the device still sports 32 GB of storage and a 1024x768 9.7" screen. Weight is up a few grams and battery life is down a bit; no surprises given the new radio and 25% clock increase. The device will be available through AT&T Business Services and major retailers, pricing and release date remain a mystery, however. Why HP would push a spec update to its brand new tablet is also a bit of a mystery? The note about the device being sold through AT&T's enterprise sales division is a big clue, though. It's likely this is part of HP's efforts to push the TouchPad as an enterprise tablet, much like RIM's efforts with the PlayBook. Execs are far more likely to pay a premium for a more refined experience and expanded featureset than your average consumer. Either way, we'll update as we know more, and keep your eyes peeled for our TouchPad review soon. As RIM is crashing and burning. Shares plummeting, disgruntled employees writing open letters about how poorly run RIM is. A failed tablet launch that makes HP's TouchPad launch look like a success. Oh by the way what is that thing? 7'inch copy of WebOS that needs a BB phone to get email?!? A Speak 'n Spell could catch up with that RIM tablet. HP's acquisition of Palm wasn't without some missteps but their OS is way better and updates will fix most of the problems which will be released soon. HP is the largest PC manufacturer and is ramping up more more employees for WebOS and about to launch a huge marketing push. 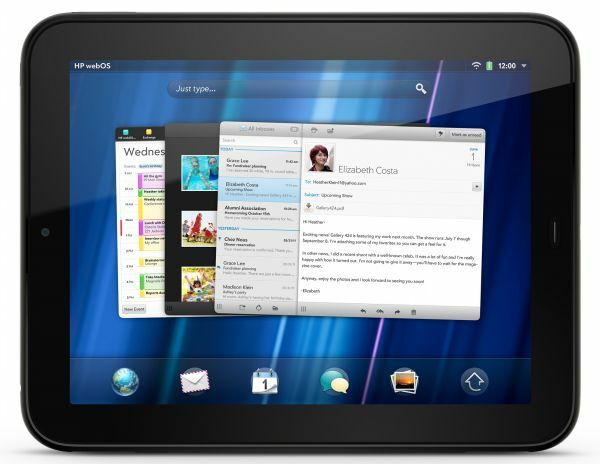 HP has many more WebOS products coming down the pipeline. Stocks don't magically go to a P/E of under 4.5 because of a few clueless analysts. If you are blind to RIM's problems, you should check that you did not leave your reality distortion field running overnight. A 53% price drop year-over-year when the S&P is up 21% in the same time is also not a great sign. Yeah yeah, RIM is doomed because their stock price went down, MS is doomed because their stock is not growing for decades... who else on your shopping block? Google because they're gonna hit a speed bump and slash their profits tomorrow? DOOMED! I love clueless analysts, so much fun :))) Same guys who asked you to buy RIM shares when they were $140 a pop now ask you to sell them when they are $28 a pop. Nice eh? That you are long RIM and not regretting it is all I needed to know. If you are value investing (which you imply), unless you have been long RIM for more than five years, you couldn't have made money on it. The last time it was this low was in 2006. Every comment you make reeks of either ignorant fanboi or just flat out lies. The RIM tablet has no significant market share. They are looking at under 1/2 million total tablet sales that's pitiful. Apple did that in under an hour of sales. They have a huge worldwide presence in the smart phone market not the tablet. I'm not going to feed the trolls but I will simply say, here is a link to their financial statement breakdown, and everything you believe is fantasy. You're completely wrong in every way and noone cares to hear you delusional ravings. In what country did RIM get "best mobile OS"? I should say "which planet" but I'm trying to not be condescending nor rhetorical.